Yesterday my three older sisters, my mom, my two sister in laws and my little neice went shopping for my sister's wedding dress. Yes, I was doing a little pouting since I was the only one who couldn't make it. I guess that's what you get when you live clear across the country. Anyway, she found one and I hear it is beautiful. I am so pleased for her. My cute sister Dawn is one of the best people I know. She is continually trying to do what is right and I seriously don't know anyone who does a better job at it. But, at the same time, she enjoys life and has an awesome sense of humor! She definitely inspires me to be a better person. August. I also can't wait to be back with my cute siblings, and siblings in-laws. My sisters: Erin (19 months older than me), Angie (5 years older than me), and Dawn (3 years older). 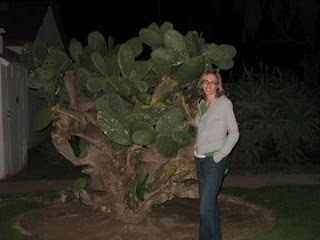 Now that I am back home, there isn't as much time to blog. Oh, it seems like just the other day that I thought having just one child was hard (not that I still don't think it is) now I am just amazed at all I am able to do when I just have one with me. Well, we had a pretty relaxed Easter day with just our family this year. 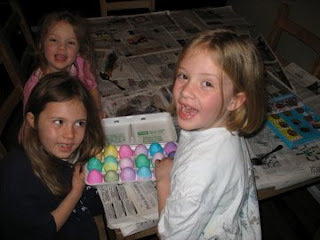 We played a few games, took an Easter stroll, had a fun Easter egg hunt around the house, watched The Lamb of God video, and had a great ham and potato dinner. It was my mom's birthday too, so we had a fun chat with her on the phone. Happy Birthday mom!! This year I didn't get Easter dresses, but my friend Mendy gave me a ton of hand-me-downs so my girls feel like it is Christmas, as far as dresses goes. I am so grateful since I am finding it harder and harder to find modest, cute dresses. The girls spent all of one afternoon trying dresses on and modeling them to me. My favorite was when Teralyn came running into the kitchen to Brian and I and in a frilly dress and said, "we've got Annie!". Bri and I cracked up. They had recently watched Annie and I guess that little part stuck out in her mind. 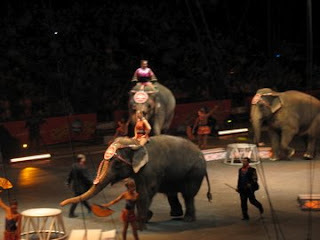 Two Saturdays ago we were able to go to the Ringling Brother's Circus in Baltimore. We got tickets quite a long time ago and were so excited (I think Bri and I were more excited than our kids). We had a good time. 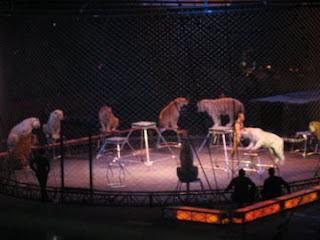 We saw acrobats, elephants, a tiger show, a dog show, horses and zebras, and lots of lights and noise. The older girls really enjoyed it although Ashtyn would have probably rather been at a friend's birthday party that she was missing. 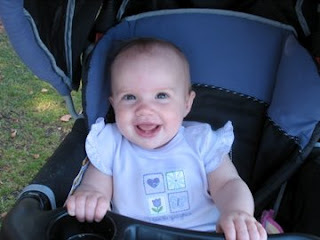 Oh well, we endured the crankiness and she actually made it to the last half hour of the party, so we were all happy. Raegan also wasn't so thrilled about the noise and by the end, she was done. All in all we were happy we went. In the morning we packed all up and Bri left for his class. 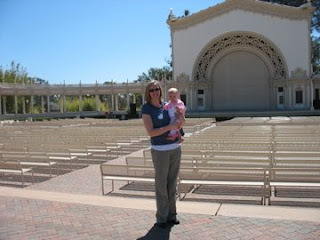 I let Raegan sleep for a while and then Reagan and I headed onto San Diego zoo. I debated whether or not to go because, well, it's not so fun when you are by yourself with just a baby who could care less about the animals. But, I had to check it out so I decided to do it. Well, I'm glad we went. It was such fun to see, and such a cool zoo! With my ticket, we were able to ride on the bus tour that takes you all around the zoo from the bus. Basically, it takes out the walking. Raegan loved this part of it. She just stuck her head out the window and enjoyed the breeze. I liked it too, it gave me an idea of what I wanted to walk around and see. So, after the bus tour we walked around for a few hours. 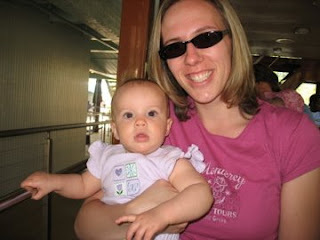 It felt a little weird to be with just a baby who could care less, but it was such a fun zoo, that I had a great time anyway. We, (or I guess I should say I) especially liked the polar bear (who dove for a bone in the freezing water), the gigantic ant eaters, and the koala bears. Raegy liked.... the kids on the bus tour. Anyway, we had a great time. I parked really far away though, so we did a ton of walking and we were pretty dang tired at the end. 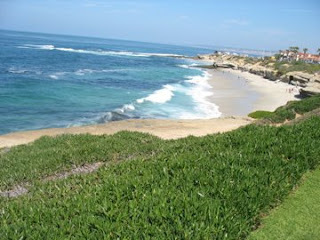 We then went and picked up Bri from his class and I just had to show him La Jolla, so we headed on out to the beach. It was beautiful again and one of the best parts of our whole trip. 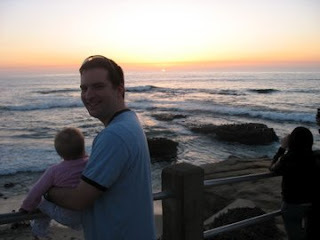 He got to see the seals and then we watched the sun set over the ocean. We stopped in at a little Thai food restaurant and ate outside on their deck while we watched the sun go down. Oh the Thai food... it was amazing! This was actually my first time trying it and I am determined to find a good Thai restaurant in Maryland now. I ordered a dish called Drenched Noodles. It had chicken, sprouts, onions, a few peppers, cilantro, and yummy noodles. I couldn't stop myself from saying "mmmm.. this is so good" through the whole thing (I guess I did because apparently that is what Bri told my kids that I said). I must have sounded like Bob in What About Bob.... hmm.. how funny. Anyway, it was wonderful. We then left to wait for our plane which was leaving at 10:30. Yes, that is 10:30 at night. We were doing a red eye. I know, call me crazy a red eye with a baby, but that was how it worked out with Brian's work, so I had to do mine the same. The flight was long, and very tiring with a baby on your legs for five hours, but at least Raegan slept and we got a few minutes. We changed planes for the last hour and a half and actually slept quite a bit on that one. Brian didn't even realize that we were in the air. That's how out of it we were at the end. 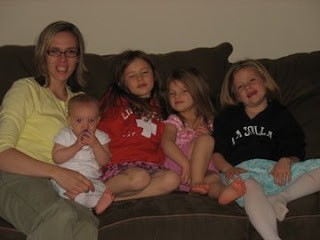 We were glad to be home and to see our little girls. Apparently all had gone really well and my girls and my mother in law all seemed quite happy (I'm not sure if that is because she knew she was leaving in a few hours or what), but we were glad to see smiles on their faces. The one major disaster they had though was the stomach flu. Yes, Ashtyn and Teralyn were both throwing up and my poor mother in law had a few nights of changing the sheets multiple times. How did we get so lucky to miss that I ask you? Anyway, thank you Marilyn for a wonderful time. She also was able to read to them The Little Princess. What a great memory they will have! * The sun! It was really hard to come home to a cloudy day! * The weather. I could totally live in 70 degree weather all year long and be perfectly happy. * The people. Yes, the people are totally friendly and kind and I had so many people help me in so many ways! Raegan also had a million people talk to her and she made quite a few buddies. * The beautiful scenery. Oh, to have beautiful palm trees growing everywhere and bright purple wildflowers on the side of the road! Not to mention the many green rolling hills covered in perfect grass everywhere and the beautiful beaches! * The kids. People have children and embrace them!! * The expense. Yes, it is even more expensive to live in San Diego than it is to live in Maryland. * The clothing. Where is it??? I mean, they have a million clothing stores, you think people would wear more of it.... hmmmm. * The feelings like, "I would be totally out of place in my minivan here." 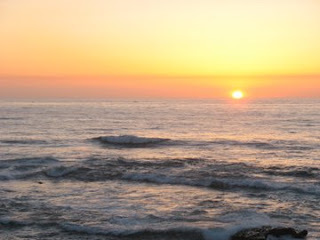 La Jolla was awesome! It was one of my favorite places that I have seen out here. Raeg and I got there around 12:00 noon and even the drive alone would have been worth it. It was actually only about fifteen minutes from our hotel. 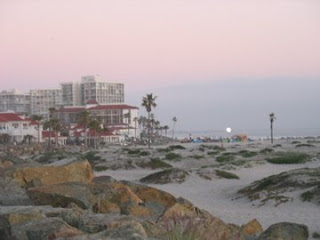 La Jolla is a suburb off of San Diego right off the coast line. 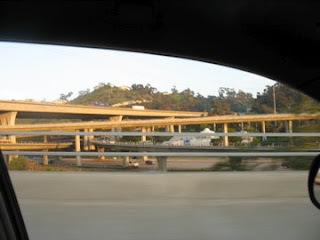 To get to there, you drive through a beautiful canyon (of course not the huge mountain canyons they have in Utah, but pretty good for Marylanders at least), and then you go into the city of La Jolla which is gorgeous and very clean. Well, we headed on down to the coast and found a great parking spot right in front of the coast line. Little did I know how great it was until we got out and right in front of us was the Children's Pool Beach which was covered with seals and sea lions!! The Children's Pool Beach is a little area right off the ocean that has a man made stone wall built in a half circle. It was originally made so children could come down and play in the ocean, but they could be kept from the dangers of the big waves. 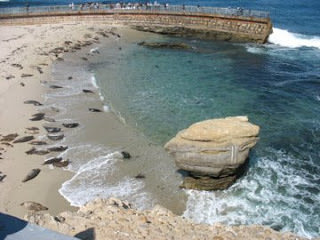 Soon after they built it, they seals and sea lions took it over and now it is their home. 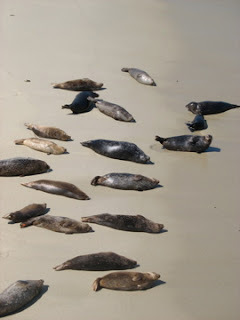 It was amazing to sea seals in the wild! I could have watched them sun bathe forever, but Raegy was just interested in the little doggie right next to us. Hmmm... oh well. Anyway, I got some great pictures that I will post later. Next we strolled up and down the coast line and just took in the scenery. After a while I decided I better find my girls the souvenir that I have been looking for (hooded sweatshirts), so we went shopping again. Just a couple of blocks up from the coast line are dozens of fun shops. You could spend a ton of money here if you wanted. We strolled up and down and I finally found what I wanted. We then stopped at a sandwich shop for a turkey sandwich (I was going safe this time) and a smoothie and went back to a grassy area over the shore to eat. Oh, it was beautiful and the weather was perfect. 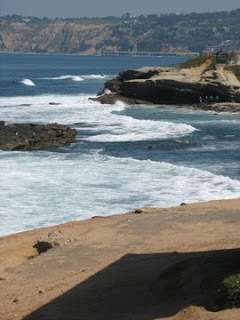 I'm hoping to show Bri La Jolla before we leave today. We left around three so Raeg could take a nap, but she fell asleep on the way back and then woke up right when we got in our hotel. Oh, the joy... So, I spent the next couple of hours trying to get her back to sleep with no avail. When I finally gave up, we spent the rest of our afternoon with me trying to read and Raeg trying to destroy my book. So, I finally gave up that idea too, and we just took a stroll around the hotel waking up all the nap takers with Raegy's babbling. It was very exciting....ha ha. Bri finally got back and we headed to In-n-Out Burger. Yes, the famous California burger joint that I have been hearing about for years!! I was very excited, but also trying not to get my hopes up too much because, well, I didn't want to be let down. I guess I kind of just expected it to be a like a fast food burger, just a little fresher (since everything they do is fresh, no freezing and they even peal and cute the potatoes right in front of you for the french fries). Well, let me just say, it was not a let down. It was fantastic! I loved the burger and it even compared to my Royal Red Robin Burger. Well, almost. It was probably the best fast food burger that I have ever had! Yummy, yummy! Oh, and the fries and shake were great too! Now they just need to get one in Maryland, right? 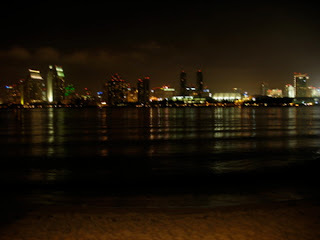 Okay so after our little burger quest, our baby was tired and cranky, but we had to go see Mission Bay, so we headed on out again. It was late when we got there, so there wasn't a ton to see, but it was fun. We parked in a fair ground parking lot and strolled up and down the beach for a while. 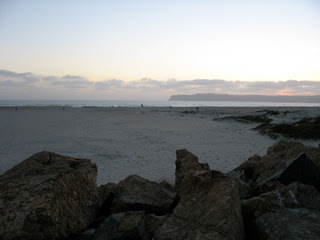 The beach on Mission Bay is right by the board walk (unlike La Jolla where you have to go down the cliffs to get in the water). There were beach houses and shops everywhere! I'm sure it is a very popular place for kids to hang out. It was different from the other beaches in that it was mostly a party beach, not so much families. It was fun to see though. Yesterday was my shopping day. Raeg and I headed down to Fashion Valley Mall in downtown. The mall looks and feels exactly like a regular mall, except it is outside and maybe a little bigger. Sometimes I even forgot we were outside until I would see a palm tree here and there or one time we ran into a swarm of bees (Ahh!). We had a great time. I especially liked the huge Old Navy store (the biggest one I have ever been to) and I spent a little more money than I probably should have, but we sure enjoyed it. Even Raegan enjoyed it. For a little while at least. 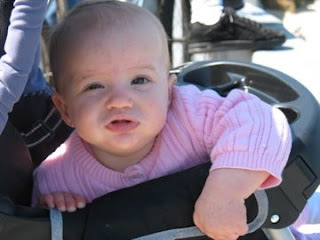 She was happily sitting in her stroller babbling to everyone who walked by. So many people stopped to talk to us. She made quite a few friends at the mall. One lady even tried speaking Spanish to us. Luckily, I remembered a little bit from high school. I recognized caliente (hot) when she touched Raegan's bare feet. I was in line buying her new socks (we keep loosing her socks due to her kicking them off). She was saying that her feet are hot even though she doesn't have socks on. I thought it was so funny that she was speaking in Spanish to me, and when she saw the confused look on my face she quickly changed to English. I've decided you pretty much need to be bilingual out here, or at least pretend you are. So, we shopped for a few hours and then Raegy and I both got really tired, so we decided to come back to the hotel for a little siesta. It was awesome! I can't tell you how long it has been since I have had nap during the day (except on Sunday afternoons when Bri takes the kids for me of course!). 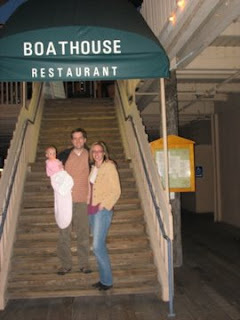 After our little nap, Bri came back and we headed out to the Boat House. 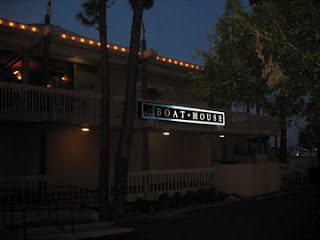 Okay, so the Boat House is another tradition of Brian's that he has been dying to take me to. If we didn't get to do anything else but this, he would have been happy. It's a little restaurant that is located close to the airport, that looks out over all the hundreds of boats docked on the shore. It's a beautiful scene, but the best part about it is that it has Lobster Wednesday. Lobster Wednesday is a huge lobster that you can have for dinner for just 11 bucks, on Wednesdays that is. 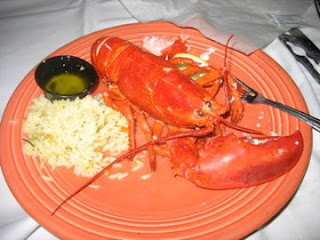 I have actually never ordered Lobster, so he was ecstatic about me trying it. He obviously loves it. This picture is taken in our car of all the over passes that were stacked on top of eachother. We counted about six in one area! When we got to the Boat House they said the wait would be about twenty minutes. Well, it ended up being about forty minutes (which was okay). When we finally got seated it took another fifteen minutes to order and then we had to wait again. By this time Raegan was getting grumpier and grumpier. I knew she wouldn't be able to last much longer. About half an hour later, we watched our order come out and being served to the table next to us. Apparently, we had ordered the same thing and so it mistakenly been given to them. I would have blown it off, but Raegan was not going to last much longer so I went and talked to our server and he was very apologetic and quickly come out with our lobsters. Raegan now had had enough and put her head down on the table to fall asleep. So basically, I had to stand and hold her while Bri ate his, and then we switched while I ate mine. We found out that they had run out of lobster (just after our order) and that was only the second time ever that that had happened. Phew!! Anyway, despite all the trouble, it was so yummy and we were so glad that it all worked out in the end. 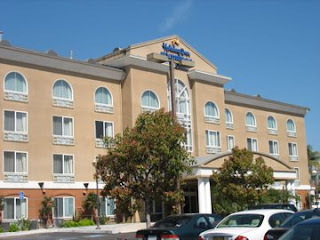 We were planning on going to the Gas Lamp after our meal, but by then it was too late so we headed on back to the hotel. 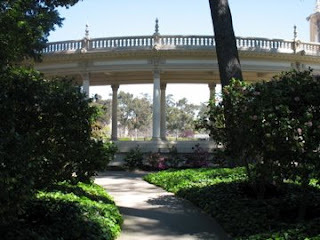 Balboa Park, Coronado Island, Lost, and Dawnie's Engaged! Day #3 of San Diego started with our usual morning routine. We wake up, get ready, go eat, Brian walks to class, Raegan goes down for a nap, I read, blog, do email, and then Raegan and I go off to play. 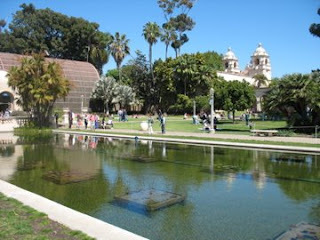 Yesterday our adventure was to go to Balboa park in downtown San Diego. 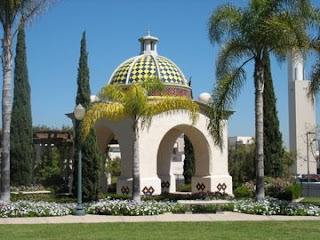 Balboa park is the nations largest urban culture park and probably the largest tourist attraction in San Diego. It's a huge area with multiple museums, gardens, playgrounds, and even hiking paths to go on. 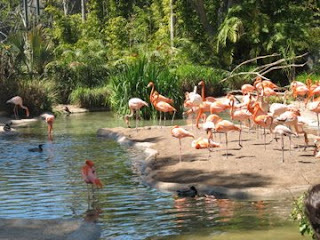 The San Diego zoo is also just north of the park, so there are many things to do there. Well, Raegan and I basically walked up one side of the park and down the other. 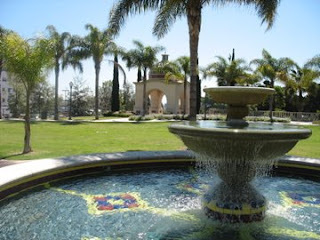 We did go into a couple of museums (the Mingei museum and Botanical gardens), but most were quite expensive so we decided to opt-out. We were happy just looking though. Everything was so beautiful and green. The weather was perfect (about 68 degrees) and the sun was shining. The museums were all built with old style architecture and there were water fountains wherever we turned around! Kids were everywhere, playing around the fountains and in the gardens, it made me miss mine. After walking around for about four hours, I debated whether or not we should keep going up to the zoo. But, when Raegan had a crying fit and I realized I hadn't nursed her for a few hours, or changed her diaper all day, I decided against it. I guess that will be another day's adventure. So, we came home and gave Reag another quick nap, I read, and when Reagan woke up I called my cute sister Dawn who has been trying to get ahold of me for days. She gave me some great news. She is engaged! She is getting married on August 15th in the Manti temple, and thanks to Brian changing flights the other day, I already have a ticket!! Can't wait Dawnie!!! We stopped at a little Gyro shop (it has become Brian's tradition) and had some really yummy Gyros with salad and fries. We ate this outside on their deck over looking the bay. We then went shopping a little to find some souveniers for our girls. 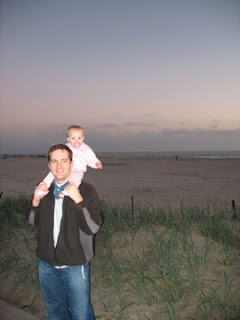 By this time, Raegan was pretty much conked out, so we decided it was time to head back. We put her to sleep in her play pen and then watched an episode of Lost on the internet with our headsets. We conked out at 10:30. I know, I know, we are such party animals.. So here I am again in my hotel room with my sleeping baby. Perfect time to recap my day yesterday..
By the time we had found a new stroller (after four hours of shopping), Raegan had about had it so we came back to the hotel to give her another quick nap and then I put in our destinations into Gus. Bri came back from his class an hour later, and we headed out to Old Town San Diego. 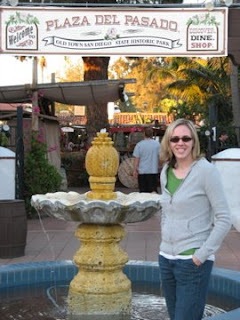 Old Town, is basically a little step through time of, well, basically the old history and culture of San Diego. Since it was first occupied by the Hispanics, it has many Mexican shops and restaurants up and down the street. It was so beautiful! I got a few pictures (which I will upload later, I forgot my cable). 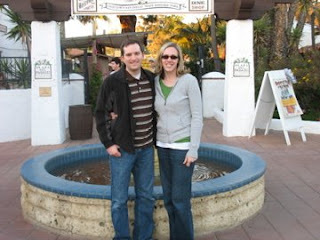 So, Joni recommended going to a Mexican restaurant in Old Town and that was just what we did. We were serenaded by some men playing banjos, and we ate outside under a canopy. It was beautiful and so much fun! Oh, and let me just say the food was delicioso! (Is that how you spell it?) We then walked up and down the streets, and felt a little out of place pushing our baby and watching all of the St. Patrick Day parties going on, but we had a great time. 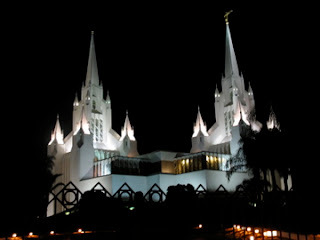 Then we got in our car and headed up to see the San Diego temple. It was beautiful!! And like Tracy said, it looks just like a castle. I'm sure my little Ashtyn would have loved it! We didn't get to go in to the grounds (it was fenced up because it was so late, but I got some awesome pictures that I will put up later. We also tried to drive up to Mount Soledad (which I hear has a great view of the city), but for some reason it was blocked off. We were a little disappointed about that. Oh well, we have so many other things we want to see so it won't be too much of a disappointment. Cactus tree I just had to get a picture of. 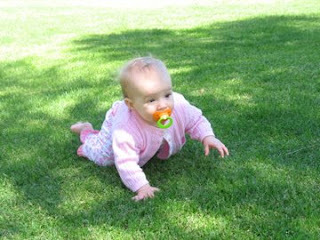 Right now I am in a hotel room in San Diego waiting for my little Raegan to wake up from her nap. Brian had a class his work was paying for in San Diego so I said, "why don't I go with you?". We asked my sweet mother in law if we could fly her out to Maryland to watch our other kids while Brian, Raegan, and I went to have some fun. Well, she said yes and she arrived on Saturday night and Bri, Raegan and I left yesterday afternoon! 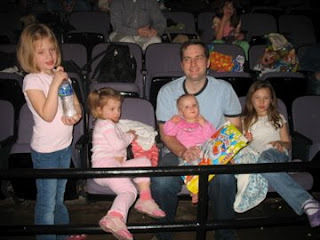 So, I know this sounds crazy, but we have never left our kids over night except once when we had just Teralyn and Shaylee and left them for just two days. I have left them with Brian once when I went to England, but Bri and I together have never left them for longer than two days!! Mostly it is because we don't have family around close enough. So, we are totally excited to have a "kid free vacation" (except our little Raegan of course) and also we think it will be so good for our kids at home to have some one on one time with their grandma. She is even going to read them the Little Princess! What a great mother in law I have! Yesterday when we left our kids, they basically kicked us out of the house. I bought them a bag of new puzzels, games, etc. that they could play with their grandma while she was here. I made the mistake of telling them beforehand, so they were totally excited for us to leave so they could get out the goods. Well, the flight was amazingly long, but we had a few good things happen in our favor. Our original connector flights (to North Carolina) were going to be separate and an hour and a half apart. So, I came early with Brian and was just going to wait around for a while for mine and Raegan's flight. Athe last minute they announced that they had overbooked the flight and if anyone would give up their seat they would get a free round ticket! Bri ran up there, and was able to change flights to my flight (yahoo!!!) and got the free ticket. We were quite happy about that. 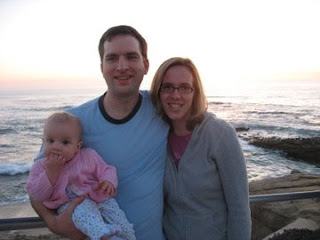 Then, when we finally got to San Diego, we found a huge break in our stroller! So we went to talk to the airline and they will reimburse us for a new one. Our stroller is actually seven years old and has been used through all of our kids, so you can imagine how glad I am to replace it. Anyway, it felt like the longest flight I have been on. 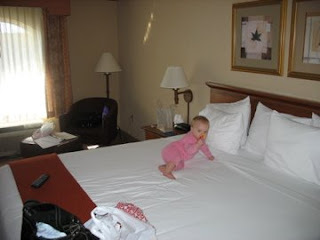 Raegan was exhausted and not sleeping much, but did pretty well for a nine month old, and we finally got into our hotel at 2:00 a.m. (Maryland time). Exhausted, we went straight to bed. So Now, Brian is at his class and I am sitting in a dark hotel room waiting for my sweet baby to take a nap, so we can go out and play! I have some great ideas from my good friend Joni (who grew up in San Diego) and now I just have to get my guts up to go adventure on my own. My first task will be to buy a new stroller. Then I think I will go shopping! I know, crazy for me to come all the way to San Diego to just go shopping, but yes, this is a vacation for me not to shop with four kids! I am so excited! So, on Tuesday I was eating my usual oatmeal breakfast and Raegan was eating her usual Cheerios when, out of nowhere, she grabs my bowl and my oatmeal and starts shoveling it in. It surprised me so much that I gave her my bowl for her to eat the rest. She enjoyed it for quite a while, but when it got to the end, she raised it above her head and threw it, shattering the bowl into a million tiny pieces. 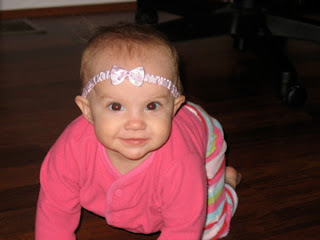 Later that same day I put Raegan down to crawl around a bit and hurried and checked my email. A minute later I hear her screaming at the top of her lungs. I ran into the kitchen and she had gotten into the cupboard under the sink. She found our dishwasher soap cubes and I guess she thought they looked tasty because she ate one! She had soap all over, coming out of her mouth and all over the floor. I grabbed a cup of water and basically threw it in her mouth to wash it out. She wasn't happy about that one, but what do you do? I spent the rest of my morning with a wet soapy baby and other floor to scrub. Then, after the girls got home from school that day, Raegan was crawling around the kitchen and stood up with the back of the chair. She must have pulled thinking it would hold her, and it came crashing down on top of her. She conked her head on the hardwood floor and the front of her head with the chair. Her two little teeth had knocked her top gums and she was bleeding all over the place. It took a while for her to calm down, but she eventually did, and seems fine besides a sore mouth and a huge bump on her head from the chair. Well, I guess she didn't learn her lesson because that night during dinner she did the same exact thing with the chair. This time she landed a little better though. 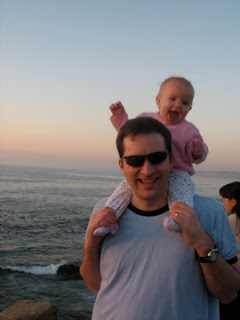 Brian held her after her fall to eat her dinner and her little hands were just shaking. It took about fifteen minutes before she stopped. Shaylee has been begging to get her hair cut for, hmmm... a year or so. 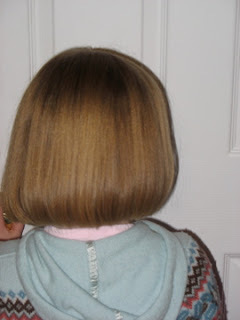 We have cut it many times before, but never short, and boy can she grow it back fast. Most of the time I give her the hair cut (I'm a little too cheap to go to the salon) and most of the time I cut off at least three inches. It is amazing how much hair this girl has though! It is so thick and grows so fast. Well, after months of hearing how hot her hair was making her neck, Brian reluctantly gave in (yes, he is the one who had the hardest time letting it go) and decided she could cut it in the summer when it gets hot. Well, that didn't stop the complaints. I don't know if he got tired of hearing it, or if he got tired of combing her hair after baths, but he surprised us all and on her birthday gave her a coupon that said she could get it cut whenever she wants, no waiting until summer. Shay was ecstatic. I told her we could even go to Cartoon Cuts to get it done (I know, I know, don't brake the bank!). Anyway, we finally did it yesterday and it was the best thing we have done for her and for us in a long time. I have to say, I was a little more emotional than I thought I would be. I mean, seven inches of beautiful thick hair!!! The hair stylist had no idea how big of deal this was. She just casually chopped it off and didn't even flinch. I was dying! But, I had no need to fear because it looks great. It fits her personality so well and the best part about it is that Shay loves it! So, here's to no more snarls, no more blow drying for fifteen minutes, no more syrupy, sticky hair, no more globs and globs of conditioner, no more people getting her mixed up with her older sister, and no more complaints! When Teralyn was in kindergarten she had a lovely friend in her class who once put her little tooth under her pillow and guess what she got? No, not just money, but fairy dust too! Wow, amazing huh? 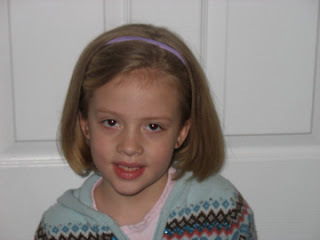 We were pretty amazed until our little Teralyn then lost her tooth and put it under her pillow that night all excited about the... fairy dust (not the money)! We just prayed that night that our little tooth fairy would leave fairy dust and luckily she did. Apparently, the tooth fairy has become a little senile. Yes, she forgets to come to our house sometimes. I don't remember the tooth fairy missing any teeth of mine, so she must just be getting old. We have had about four missing teeth in the last month between Teralyn and Shaylee and we still have about four loose ones to come very soon. I mean, who can keep up? So, the first night Shay put her tooth under her pillow, the toothfairy didn't come. Yes, major dissapointment! Her explanation was that she was probably hybernating for the winter. We thought that was a perfect explanation. I mean, who would want to come out and go searching for teeth in twenty degree weather? We also think that she is probably very very busy, and must be santa's helper (because she forgot to come on Christmas eve too). Hmm...well, Teralyn then put her tooth under her pillow and guess what? She forgot to come again. Teralyn's explanation was that the tooth fairy must be a boy (I thought that was a good explanation). Brian didn't think that was too funny.